The SoftExpert solution for waste management enables companies to manage and reduce waste, ensure regulatory compliance and improve environmental performance. SoftExpert Waste is an excellent choice to meet company needs in managing the storage, transportation, and disposal of generated waste by-products, providing added dependability and agility to these specific requirements. The system features an automatic mechanism for managing the complete lifecycle of waste products, starting from generation, through processing and finally to final disposal. The entire waste process is recorded and monitored by the work teams directly involved in each activity. SoftExpert Waste streamlines compliance with environmental regulations, through standardization and organization of all documentation to comply with all international, national, and regional legislation. The solution automatically generates data collection forms for recording all essential data on each kind of waste product – destinations, transporters, generators, etc. – thereby assuring quick data retrieval based on specifically sorted categories. One integrated solution that streamlines waste management across the organization; offers better visibility and oversight of all site-level entities; easily manages inventory of waste containers and shipments; and increases the effectiveness of the waste management efforts by tracking the movements of waste containers, quantities and types of waste in each area. Tracking of waste, from generation to temporary on-site storage, shipment and disposal. 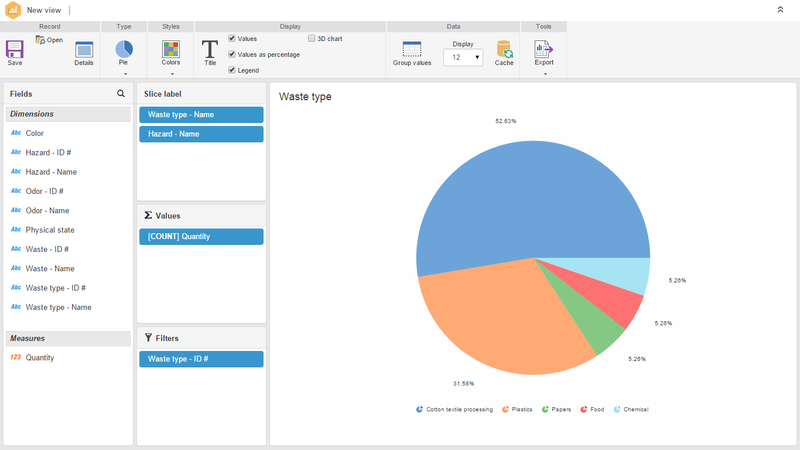 Tracking of quantities and types of waste stored in each area. Management of site-level entities whose processes and actions create waste. 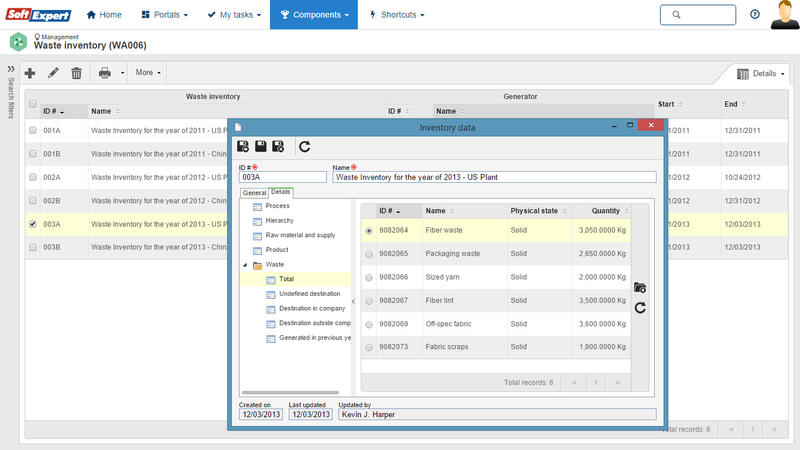 Inventory of waste containers and shipments. Tracking, management and history of container movements and shipments. 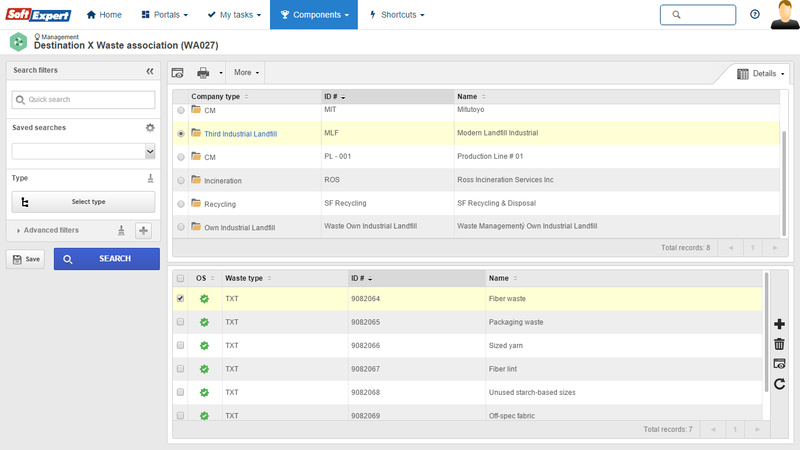 Notifications for waste shipments and expired waste. Documentation of waste shipment and invoice information, such as quantity, transporter, disposal facility, cost, management method, and dates. Categorization of the properties and chemical components of waste in accordance with relevant jurisdictions. Classification of waste (hazardous, non-hazardous, e-waste, etc.). Reports on all waste generators associated to a particular waste, hazardous and non-hazardous waste generated, waste container roll-up, waste shipments grouped by waste, etc. Managerial views based on all known data. Association of regulations applicable to every waste. 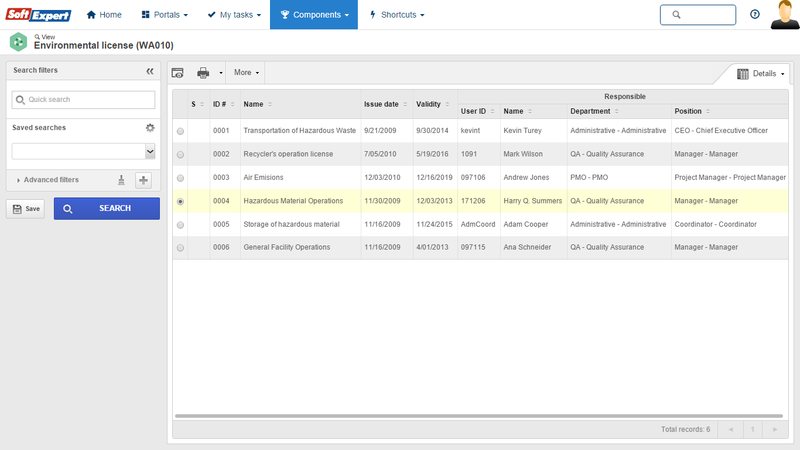 Tracking of all facility permits and their expiration dates. Management of data required for compliance with global hazardous waste regulations.